In collaboration with Steelcase, we are presenting a new experimental process called Rapid Liquid Printing, a breakthrough 3D printing technology. 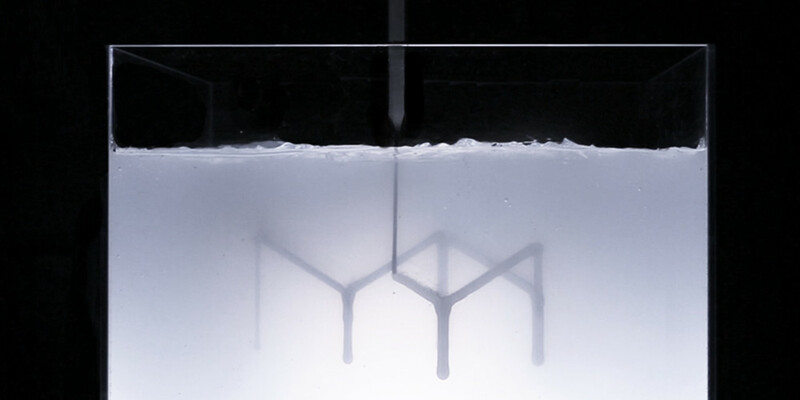 Rapid Liquid Printing physically draws in 3D space within a gel suspension, and enables the creation of large-scale, customized products made of real-world materials. Compared with other techniques we believe this is the first development to combine industrial materials with extremely fast print speeds in a precisely controlled process to yield large-scale products. 3D printing hasn’t taken off as a mainstream manufacturing process for three main reasons: 1) it’s too slow compared to conventional processes like injection molding, casting, milling, etc. 2) it’s limited by scale—although it’s good for creating small components, it’s not possible to produce large scale objects and 3) the materials are typically low-quality compared to industrial materials. Rapid Liquid Printing addresses all of these limitations: it is incredibly fast (producing structures in a matter of minutes), designed for large-scale products (you can print an entire piece of furniture), and uses real-world, industrial-grade materials. Skylar Tibbits (US) is the founder of the Self-Assembly Lab at the Massachusetts Institute of Technology (MIT), and Assistant Professor of Design Research in the Department of Architecture. Tibbits has a professional degree in architecture and a minor in experimental computation from Philadelphia University, and a masters in design computation and masters computer science from MIT. He has worked at a number of renowned design offices including Zaha Hadid Architects, Asymptote Architecture, and Point b Design, and is the founder of multidisciplinary design practice SJET LLC. He has designed and built large-scale installations and exhibited in galleries around the world, including the Guggenheim Museum in New York. His work has been published extensively, for example in the New York Times, Wired, and Fast Company, as well as in various peer-reviewed journals and books. He is the author of the book Self-Assembly Lab: Experiments in Programming Matter (Routledge, 2016), and Active Matter (MIT Press, 2017) also Editor-In-Chief of the journal 3D Printing and Additive Manufacturing. Christophe Guberan (CH) is a product designer based in Switzerland and the USA. He graduated from the Ecole Cantonale d’Art de Lausanne ECAL and is the 2016 laureate of the Hublot Design Prize. As a product designer, he explores the possibilities of material interactions, digital manufacturing, self-assembly, and variable aesthetics in his creations. Christophe’s products have been showcased at internationally recognized exhibitions and festivals such as Mutations/Créations at the Centre Pompidou in Paris, Miami Design Art Basel, the Milan Furniture Fair, and the Salone Satellite in Milan. In parallel, they have been produced by leading companies such as Alessi. His Hydro-Fold project, consisting of self-folding paper printed from a desktop 2D printer, has received wide academic and public attention that resulted in an ongoing collaboration with MIT’s Self-Assembly Lab.